I don’t get it. Who crushes on someone they think is ugly? And what does a haircut have to do with it? 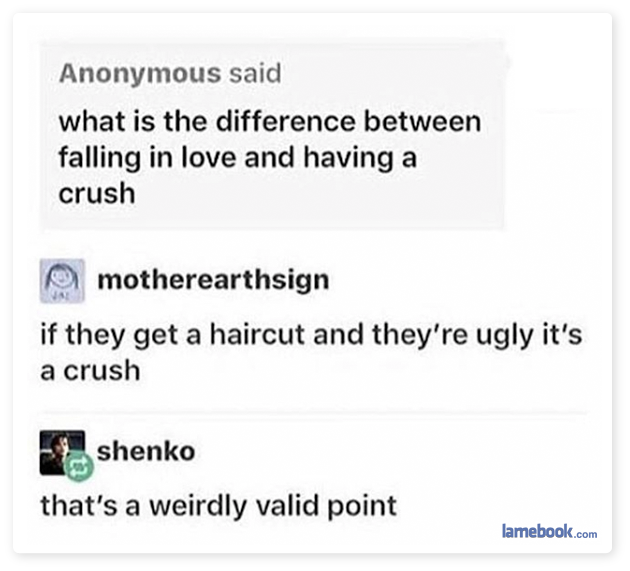 Are they saying that you can fall in love with a person, but if they end up getting a haircut that makes them look ugly, your feelings for them get dialed back to a mere crush? If you actually loved the person in the first place, something as incredibly petty as an unsightly haircut would not affect your love for them. I just don’t get the joke here at all.